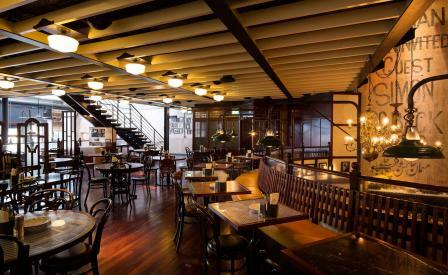 When the first Dishoom opened in Covent Garden in mid-2010, it injected a bolt of much-needed adrenaline into London’s staid Indian restaurant scene. Each successive opening has built on the group’s formula of brightly coloured, imaginatively furnished spaces that feel as it’s the Raj-via-Bombay days all over again, but zhooshed up with 60s-inspired pep and a youthful, accessible menu of modernised street food classics. The newly opened Dishoom Carnaby cleaves close to the formula while channeling a visual and aural vibe that pays exuberant homage to its namesake’s cultural cache. The references by interior designer Macaulay Sinclair are a solid roll-call of Indian nostalgia – the black-and-white checkered terrazzo floor is straight out of the Irani café playbook, art prints by the Bombay Progressives hang on walls, a jukebox rescued from Chor Bazaar stands in a corner, while the soundtrack is inspired by the popular Bombay night club Slip-Disc. In the kitchen, executive chef Naved Nasir sends out classic bun maskas, chilli cheese toast, masala prawns, lamb biryani cooked ‘dum’ style, pau bhaji, and sali boti, the latter a Parsi favourite of braised lamb served with buttered handkerchief bread. The drinks list is an inventive hoot, not least the Bollybellini spiked with cardamom, and Edwina’s Affair, a light julep of gin, mint and candied rose petals.